If life has dealt you a bad hand, these 5 assistive products for playing card games, will help you keep playing the games you love. An estimated 220 million people play bridge worldwide, and for many of us it’s the core of our social lives. So, what do you do if life takes a turn for the worse and you have trouble playing? Scenarios such as you fall and break your arm, or your memory isn’t what it used to be. Maybe your hearing or vision has deteriorated. That kind of thing. Does this mean you give up playing a game you love? We think not. In fact, we think it’s terribly important to carry on playing. It is believed that bridge can boost the immune system through its stimulation of the dorsolateral cortex, which is involved in the higher order brain functions needed to play the game. Playing bridge regularly will keep your brain young and your mind alert and recent research has suggested that it may even stave off degenerative diseases such as Alzheimer’s. I find that my hand starts to ache if I’m holding a handful of cards during a lengthy game. Children can struggle to hold their cards too. Some players simply can’t hold their cards because of arthritis, injury or disease such as Parkinson’s. Playing Card Holders are the solution. They come in a range of shapes and sizes but they all do the same thing: they hold your cards for you. For those who would rather not hold anything at all during a card game, a table top holder would be a better choice. We have two styles. 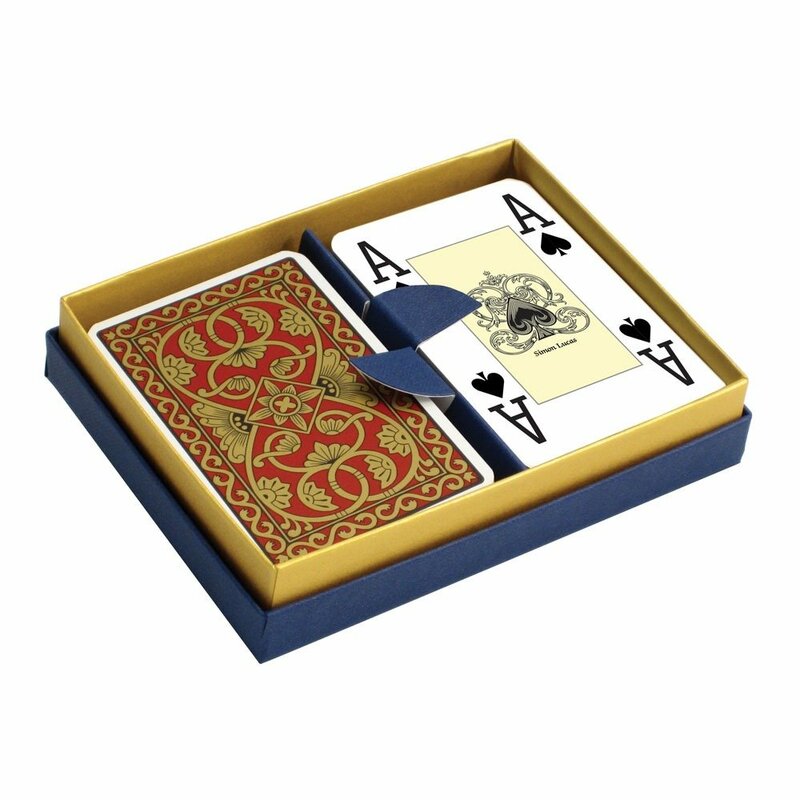 The Deluxe Playing Card Holder is a great design – it holds up to 25 cards making it ideal for games such as bridge and canasta. In terms of appearance, this black plastic card holder is more functional than desirable. However, the same is not true of the Thuya Wood Playing Card Holder. Our thinking is that if you’ve had the misfortune to be unable to hold your cards any longer, why not have the pleasure of treating yourself to a beautiful card holder to assist you? Made from gorgeous Thuya wood which has been favoured by the connoisseur since Roman times for its exceptional durability, gorgeous grain and splendid aroma, the Thuya Wood Playing Card Holder is really a very desirable item to use. We’ve all played card games when someone’s made a hash of the shuffling. It’s a skill that takes time to learn and if anything happens to you that affects your hand movement you’ll find shuffling more difficult. This is where a card shuffler can help. They’re a battery-powered device which is simple to operate: just divide the pack roughly in half, put the two stacks of cards either side of the shuffler and press the button. The cards are shuffled together into the central compartment. To get a more thorough shuffle, repeat the process another couple of times. As a Card Shuffler is easy to use, it gives independence to children and adults alike so everyone can fully participate in the game. If you’re thinking of buying one, Card Shufflers are quite widely available from many different retailers. As a mass-produced, battery-operated item, reliability can be an issue. Ah! The bidding is over, cardplay has begun. And here come’s that all-too-familiar question: “What are we in again?”!! The fact is, many of us are very busy people nowadays, with our heads overloaded with information about all the busy-ness in our lives. The result? There isn’t always room left in the memory bank for small things such as the contract we’ve just made at bridge. Luckily, a bit of help is available; let me introduce you to the Contract Indicator. A Contract Indicator is a little item that sits on the card table and reminds everyone of the contract. Unlike a trump indicator for whist which only reminds players of the trump suit, a Contract Indicator displays the number of tricks bid as well. Known variously as a trump/contract/bridge indicator/reminder/marker, the item we have produced is called the Contract Indicator & Scoring Aid. Ours is a little free-standing spiral bound flip chart and you simply flip over the laminated leaves to display the correct contract. It also contains scoring information for both rubber and chicago bridge so it’s an all-round useful aid. If you struggle to hear the bidding, then Bidding Boxes are the product for you. Almost unheard of amongst social bridge players a decade or so ago, the use of these boxes is increasingly becoming the norm nowadays. They come in various shapes, sizes and prices but they all function in pretty much the same way. Each box contains a set of bidding cards: Pass, Stop, Alert, Double, Redouble and number cards 1♣ through to 7NT. The bidding is made silently, by taking the card with your bid on it out of the box and placing it on the card table. Each player has their own box and bids in the same way. Not only are bidding boxes great for the hard-of-hearing, they also give a visual record of the bidding. Click here to see our extensive range of Bidding Boxes.. Handy tip: If you’re playing bridge with someone who is hard of hearing, the direction of the light can make a big difference. If the person with the hearing difficulty sits with their back to the light source and the rest of you sit with light shining on your faces, it will be much easier for them to read your lips. The numbers in the corners of card faces are typically around 9mm high, and the suit symbol beneath about 6mm. As the print on these standard index cards is relatively small, deterioration in vision can be a big barrier for playing card games. Luckily, large print playing cards are available. There are different styles of faces which suit people that have different needs. Large Extra Visible Playing cards are still bridge size cards but they have the largest index in our range. The numbers are 15mm high and the suit symbol beneath is 10mm. Instead of having the usual arrangement of suit symbols or pictures in the centre, there are just two very large suit symbols, each 21mm high. The only slight disadvantage of this layout is that the 6s and 9s can be difficult to distinguish between. However, these are very popular cards and are favoured by those needing the largest possible print. Did you know that many poker players prefer cards with jumbo faces? This is great for bridge players because it means there are lots of poker size cards available with larger print faces. The difference between poker playing cards and bridge cards is the size; poker cards are 5mm wider. Other than that, they’re the same. Most of the Modiano 100% Plastic Poker Cards have jumbo index faces, plus the normal layout of suits and pictures in the centre. The numbers are a good size at 14mm high as are the suits beneath at 12mm. The cards are plastic which makes them slightly more slippery than cardboard cards but it does mean that they’re durable and much harder-wearing. See our range of Modiano playing cards. Handy tip: Good lighting is essential for helping players that have problems with their eyesight. Ideally, the player with impaired vision should sit at the seat that has the strongest light shining on it (however, not with their back to the light otherwise their cards will be in shadow). One of our customers finds that wearing a head-torch has been of great benefit to her. Life has its ups and downs, but I hope I’ve given you some useful insight into some of the great products for playing card games available. Especially to help you keep playing bridge. Do you have any tips for other bridge players? Have you managed to keep playing bridge against the odds? I’d love to hear from you. Please use the comment box at the bottom of this page.